Monday: Missy Tippens shared about R.U.E., resisting the urge to explain. Wednesday: Ruthy barrelled into town with talk about grabbing stories out of thin air and looking at them from every possible angle... and the winner of a copy of her newly re-released book "The First Gift" is Pat Jeanne Davis! Monday: Jan Drexler is peeking out of her writing cave to invite you to spend some time in her world. How does she create story settings that make her readers feel like they've come home? Stop by on Monday for some great tips. Wednesday: Publishers Weekly Bestselling Author Debby Giusti will attend the RWA National Conference and wants to share some travel tips for anyone who plans to attend a conference in the not-too-distant future. Stop by to read her blog, "What Debby's Packing in her Suitcase...for the RWA National Convention." Ruth Logan Herne is addressing a local book club on Tuesday 6/19 at the Maplewood Branch Library in Rochester, the very same library she'd hike to as a small child to feed her cute kid passion for books, books and more books. 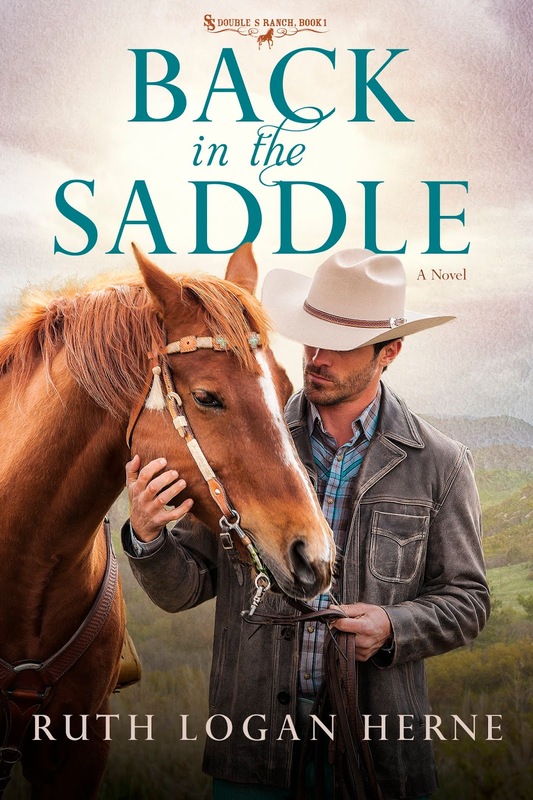 The book club just finished reading "Back in the Saddle", and Ruthy can't wait to hear what they have to say! Jan Drexler's "Journey to Pleasant Prairie" series is on sale for the month of June! E-books (both Kindle and Nook) are listed at special prices at BarnesandNoble and Amazon - starting at 99 cents! Start Your Novel with a Bang! 12 Ways to Hook Readers by Sara Shepard at the BookBub Partners Blog. And all of us in Seekerville would like to extend huge congratulations to the ACFW Genesis finalists! Many of us are Genesis/Noble Theme alumni and we've got lots of good stuff to say about that chance to shine! Here are the finalists for the 2018 Genesis Contest. Winners will be awarded during ACFW’s annual conference gala in Nashville. Thank you, Audra, for the Genesis shout-out. It's the furthest I've ever gone in this particular contest, and I am over the moon. (Not really, I would need astronaut stuff to breathe.) I am humbled and pleased. The floor guys are STILL here, but I am working around them. It's like Murphy Brown's house painter, if anyone can remember that. I had 48 hours to revise my Genesis entry and I did it with the sound of a tile cutting machine in the background. This may have topped my line editing at the Laundromat this past winter, we'll see. This next week looks relatively placid and I may be able to get some writing done in peace. I'm excited for Ruthy speaking at her childhood library. She has really come full circle, hasn't she? My library for most of my childhood was a bookmobile, with only occasional trips to the big "downtown" library. Right now all my fans could FIT in a bookmobile, but not forever. ACFW. I get to go to NASHVILLE! Congratulations. I'll be rooting for you. Thank you, Wilani. Keep writing, maybe you'll join us some day. Congratulations, Kathy. I am so happy for you. I am rooting for you, too. Kathy, I'm so glad you were able to do your quick revisions in that chaotic setting!! I'm also glad to hear you're able to go to ACFW! Kaybee, I'm so excited for you! Kathy, that is awesome! And I'm delighted to go back to the Maplewood library, too. They were so good to me as a child, coming in and taking as many books as I could carry back home... and then repeating it in a few days! God has blessed me, that's for certain! I get to go to NASHVILLE! I love saying that. Young girl (okay, not so young) heads to the music mecca to fulfill her dreams of being a recording artist (okay, her dreams of being a fiction writer). Will she fall on her face? Will she know heartbreak? Will she reunite with her luggage? I actually wrote a country song once. Well, made up the titles, I'm not at all musical. The "A" side of the single was "You Had Me at Goodbye," and the "B" side was, "Not Tonight, I've Got a Heartache." Which is probably why I'm not a country music superstar and should stick to writing. Woo! Woo! Woo! Kathy's goin' to Nashville!!! Congratulations on your Final!!! I'm crazy excited for you!!! LOL, Kathy! I love those titles. I would not be surprised if they've actually been used! I really like your country song titles. I think one has real potential. I envision a song that is made up of lines from other songs. I even wrote a whole country song for my hero to sing in "Stranded in a Cabin with a Romance Writer" which I sang to Julie Lessman as part of a critique. I bet that has never happened to her before or afterwards. Because Blakey boy, I'm no Tammy Wynette. I've got sweet Gwen to comfort me. I will be looking forward to Debby's post on Wednesday. I have not been to a major conference in a LONG time and need to know how to pack for the 21st century. Congratulations to all the Genesis finalists. I hope everyone has a great weekend. I'm hoping to get a lot of writing in. Me too, Wilani. Good luck with yours. I hope you do, too, Wilani. I hope you're feeling better. Wilani, I hope it went well! I've been doing overnight writing to avoid the house crowd.... Sneaking downstairs, grabbing a diet Mt. Dew and settling in. Going to the mountains with my daughter. See you Monday. Congratulations to all the Genesis Finalists!!! And congratulations to the WE prize winners! My husband has a new schedule, so Saturdays are work days for me. I'll be diving into my WIP in a little bit. Have a great weekend, and Happy Fathers Day! Jan, I hope you're productive today! We've been running errands this morning as well as going to Five Guys for lunch. My favorite burgers! Jan, that's the best way to make use of that new schedule... he works so you work. We gotta do what we gotta do! Happy Weekend, everyone. Hope it is a good one. I plan to hit the writing hard this coming week. I had my summer planned out. I allowed one week to do house projects, then last week was supposed to hit the writing hard. But then I got sick and lost a week. Now I am ready to get back at it. I hope your illness is completely gone, Sandy! I'm sorry you were sick, Sandy! Hope next week is just what you planned. Oh, Sandy! We've got strep going around up here again, and it should be outlawed... because it's summer. And yet, the bacteria are partying! Congratulations to all the Genesis finalists and Seeker Winners! Happy weekend, Seekerville! I know it's almost over, but on the farm we kind of forget the whole idea of weekends... although we do go to church on Sunday, and it's a welcome quiet time of prayer and reflection!!! Congratulations to all winners and asking God's blessings on every one of you. AND GENESIS FINALISTS!!!! Super huge ginormous congrats to you! I finaled and won that contest a few times... it was an amazing feeling! You are on the right track, absolutely!